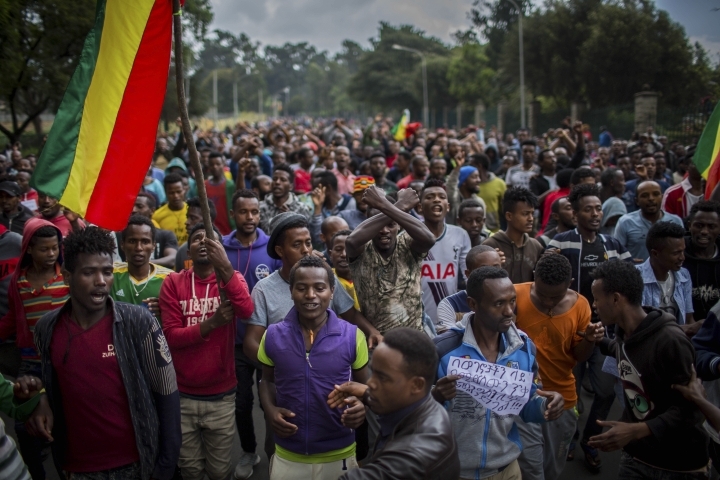 ADDIS ABABA, Ethiopia — Ethiopia's stunning political reforms are now threatened by long-standing ethnic tensions that have roared back to life since a young prime minister took power just five months ago and promised greater freedoms. While exiled groups once banned as terror organizations are welcomed home to join political dialogue, deadly violence erupts on the fringes of celebrations. 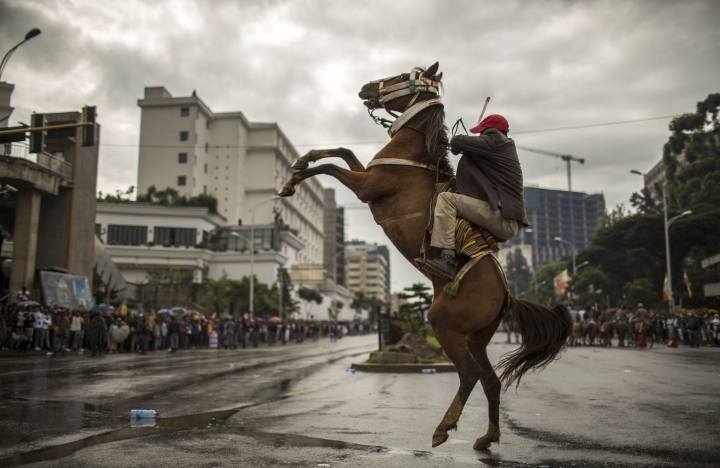 On Saturday, tens of thousands of people gathered peacefully in Addis Ababa's Meskel Square to cheer one group's return. Two days later, police fired tear gas there to disperse people protesting killings blamed by some on youth from the same ethnicity. Suddenly, the government of 42-year-old Prime Minister Abiy Ahmed appears to be reaching for security tactics whose unpopularity helped to bring down the previous government, while some Ethiopians who cheered Abiy's reforms now accuse him of being soft on the unrest that poses his biggest challenge so far. The internet winked off this week across the capital, a once-common act to control dissenting voices. The National Security Council has vowed "all necessary measures" against those spreading anarchy, the state-affiliated Fana Broadcasting Corporate reported. Some have even called for the return of the state of emergency that Abiy lifted in one of his first acts in office. The prime minister himself, who shocked the country with a dizzying series of reforms that included freeing imprisoned opposition figures and vowing free and fair elections in 2020, has made warning sounds against the unrest. "There's nothing more shameful than a group of people committing these types of crimes against their fellow citizens," Abiy said Tuesday while visiting a camp for those displaced by the latest violence. Stability is crucial in a country whose fast-growing economy, 100 million-strong population and security ties make it the powerhouse of the turbulent but strategic Horn of Africa region. Ethnic-based conflicts mainly over scarce resources are common in Ethiopia, which is home to more than 80 ethnic groups, but now the communal violence is spiraling at a scale that alarms many. 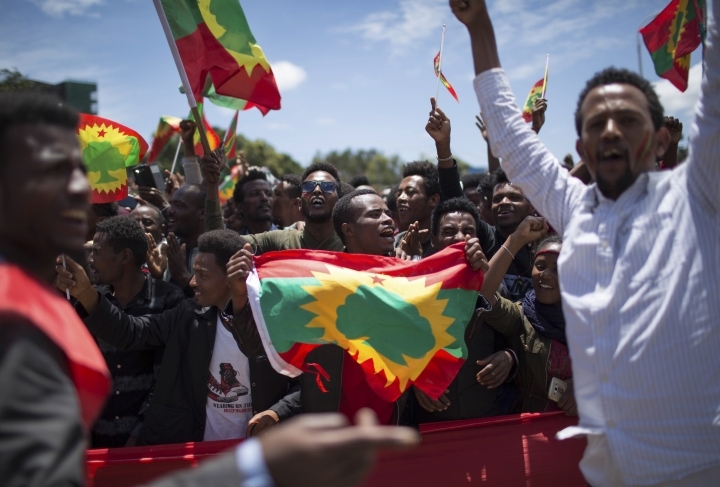 "If this trend continues, I fear a time will come soon when Ethiopians yearn for the old dictatorial times," Mussie Tefera, a university student, told The Associated Press. Ethiopia since 1991 has been led by a ruling coalition and allied parties that hold every seat in Parliament and for years were accused by human rights groups of suppressing critical voices. 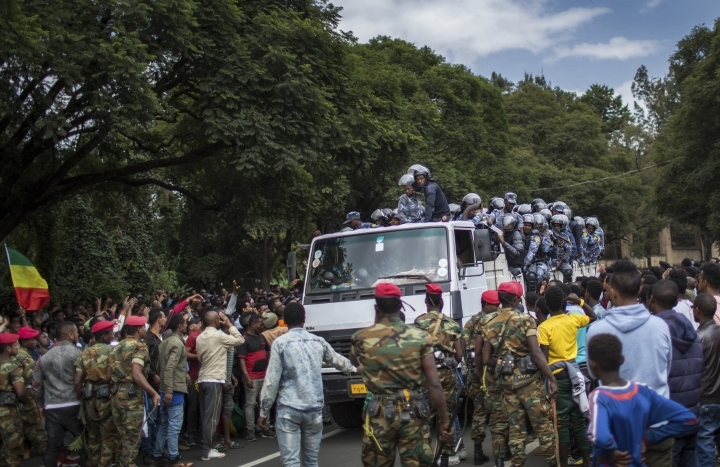 That grip on power slipped after anti-government protests that began in late 2015 in the Oromia and Amhara regions, home of the country's two largest ethnic groups. Abiy's arrival in power was a surprise. He is the first prime minister from Ethiopia's largest ethnic group, the Oromo. As the son of a Muslim father and Orthodox Christian mother who converted to Islam he has spoken out for tolerance. On an exuberant tour of the United States that drew large crowds, he spoke to Ethiopian communities and invited emotional exiles long wary of the government to return. His appeals to peace and openness, however, have not healed long-standing ethnic fractures between groups such as the Oromo and the Somalis. Some disputes have worsened. The number of the country's internally displaced people has reached 2.8 million, up from 1.6 million at the beginning of the year, according to the United Nations. For some, the surge in unrest comes with the recent shifts in power. "Local cadres and officials are instigating this violence for a petty political gain," Ethiopia's disaster prevention chief, Mitiku Kassa, told The Associated Press after fighting between the Oromo and others in the Gedeo and West Guji zones. Over the weekend, the U.S. Embassy was among those issuing safety warnings amid the violence on the outskirts of the capital as many Ethiopians expressed outrage over the alleged targeting of people based on ethnic identity. More than 20 people were killed. 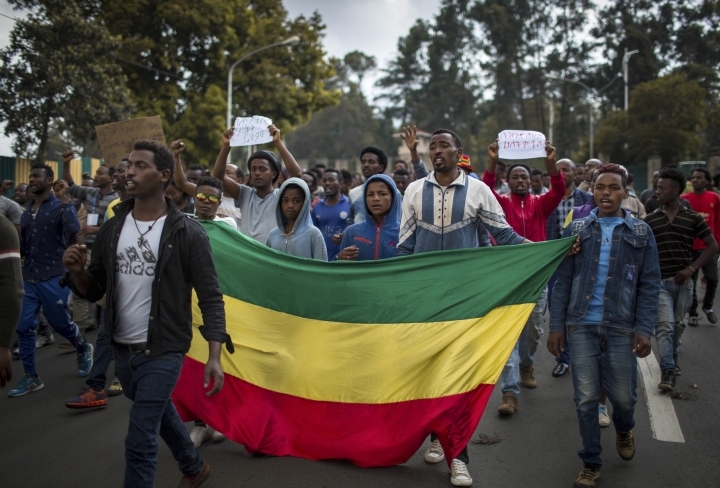 "We demand justice," some protesters chanted as they passed by the prime minister's office on Monday en route to Meskel Square. By the end of the day, mobile internet service across Addis Ababa was blocked as citizens and Amnesty International pointed out hate speech against non-Oromo groups on social media. Internet service returned on Wednesday. While some accuse "paid agents" of trying to paint a bad image of Oromo youth emboldened by Abiy's rise to power, others suggest some unrest is being orchestrated by groups in the ruling coalition that lost power when he took office. 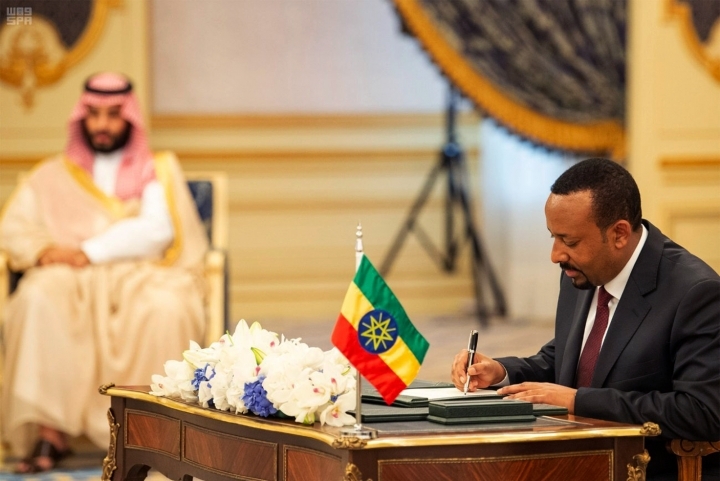 Any internal frictions could be exposed when the ruling coalition holds its congress early next month, when it is expected to take steps to implement Abiy's whirlwind political and economic reforms. "In a system where party and state have long been indistinguishable, the (coalition's) fragmentation would be a dangerous thing," Michael Woldemariam, assistant professor of international relations at Boston University, wrote this month in Foreign Affairs. 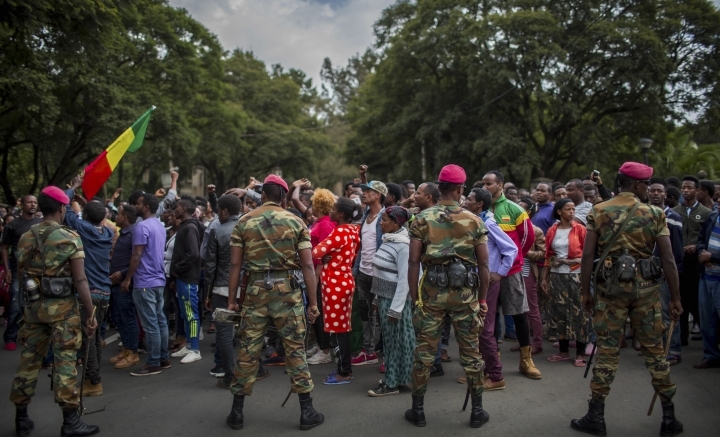 Ethiopians have long expressed grievances over the country's federal structure that is largely based on ethnic lines and has been held together by the ruling coalition and its security forces. "If the federal structure is implemented properly, it is fine," said Berhanu Nega, whose Patriotic Ginbot 7 opposition group had been listed by Ethiopia as a terror group alongside the al-Qaida-linked al-Shabab before being welcomed home from exile by the new government. "But what we have now here is a structure based mainly on ethnic identities and hence creating all these problems." Abiy's administration is failing to guarantee law and order, said Awol Kassim Allo, a lecturer in law at Keele University School of Law in Britain. "At this defining moment for this country and its people, the state needs a commander-in-chief that stirs the ship out of the storm," he said. "If we fail to defend this moment of ours and support this understandably challenging transition, we will all lose a great deal."